There are several medieval "hall houses" - a building consisting of a large open hall with a fire in the centre - in Henfield, of which Lashmars Hall is one. (St. Anthony's Cottage in the upper High Street is another). You can see the distinctive sloping side roof which is typical of these early houses. In 1374, the tenant of 'Lachemershale' was John Nicol, the swineherd to the lord of the manor of Stretham, the local Bishop. The 1841 occupant of the house was 40-year old farmer Thomas Warden and his family. George Batchelor, a 58-year old agricultural labourer, was the occupant in 1851. In 1891, the hall was occupied by 59-year old farmer Thomas Warden - the son of the Thomas Warden in the 1841 census - his wife Sarah and their son Henry. In 1901 it was occupied by 66-year old Thomas Goacher, a stockman. In 1911, the occupant was 54-year old farmer Henry Alfred Sayers, his wife Anna Elizabeth and their 5 children. 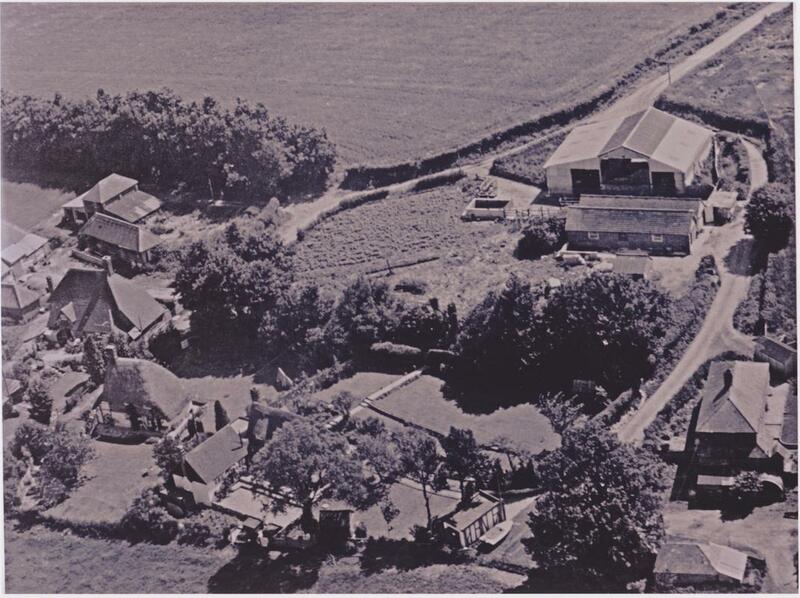 The aerial photo above was taken in the late 1960s or early 1970s. Lashmars is on the extreme left middle, with Neaves and Ameys Cottages just below and to its right. Lashmars Hall is Grade II listed and stands at the end of Stonepit Lane, which runs off West End Lane and ends down by the river Adur. C17 or earlier timber-framed building with painted infilling. Tiled roof with pentice on south side. Horizontally-sliding sash windows. Two storeys. Three windows. Lashmars Hall: This shows the house as photographed one spring day in 2005. Lashmars Hall: This photo was taken in 1947. Lashmars Hall 1: A b&w photo of the house from the late 1800s. Lashmars Hall 2-3 Two b&w photos of the farmyard from the late 1800s. Lashmars Hall 4: A photo of the front of the house. All photos of the house on 'HOUSES 63" were kindly scanned and sent to me by the present owner. Lashmars Hall 1: A view of the house from Stonepit Lane. Mid-January 2019. Lashmars Hall 2: The façade of the house from the garden in mid-January 2019. Note the side entrance in the wall and the renovated side door with porch. Lashmars Hall 3: A side view of the house from the farmyard. Mid-January 2019. Lashmars Hall 4: The rear of the house. Mid-January 2019.